ProsperVue helps me find buried treasure. ProsperVue helps me find alternate leads and cross vertical business opportunities that I can cross sell to. It's nice to know that if I had success selling to Plumbers, I can find multiple plumbers in the same neighborhood and propose my solution to them. I can also sound relevant and appear to know the market and the local competition by name dropping local businesses that I have either worked with or am aware of. ProsperVue is an incredibly powerful tool for our entire inside sales team to sell local. It arms the reps with vital data to approach each call with to be as relevant as possible to the prospect. Great configuration flexibility to get the most out of it. Great Prospecting Tool! – ProsperVue has most definitely been a positive game changer for myself and our office! With knowing the closest name drops this helps credibility and makes the calls a little bit warmer. Great Tool, love it! Data I Can Use - This is a powerful tool that is specific to my needs, allowing me to connect with my potential customers on a consultative level. Easy to use and navigate, this does not slow me down, rather it increases my process and effectiveness. I believe this tool is amazing! It provides real-time information that is mission critical to the sales calls and processes that I utilize. To be armed with such information is an invaluable, and absolutely necessary, tool that has helped increase my success with prospective clients - leading to more closed-won opportunities! Try for free for up to 10 users! 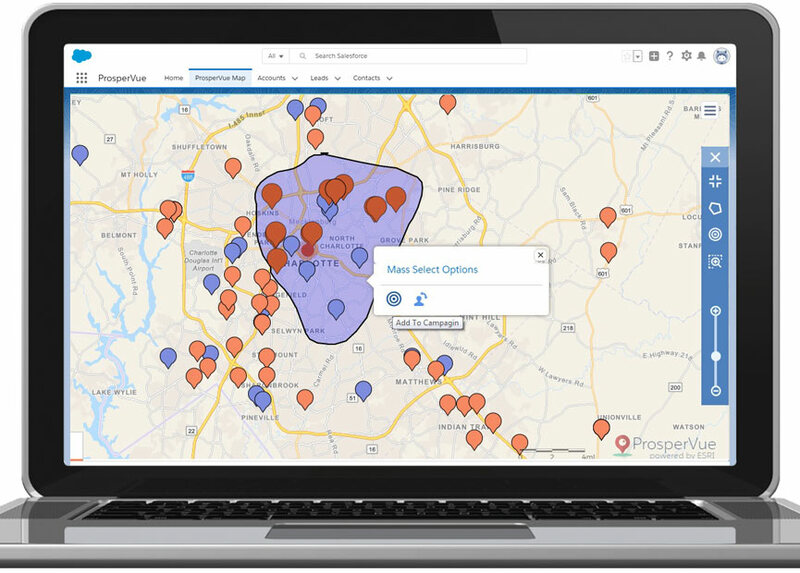 ProsperVue’s Mapping Edition leverages the power of geolocation for business development and marketing. 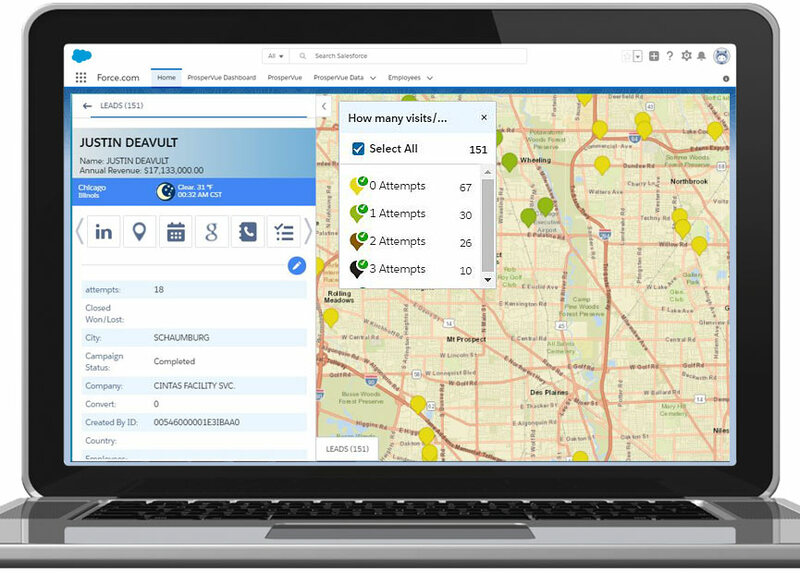 Visualize territories, assign accounts, prioritize opportunities to make sales teams productive quickly. ProsperVue increased call conversions and scheduled appointments, leading to a 26% increase in deal size. ProsperVue geo-coding and mapping features helped field sales to expand territories and increase pipeline by $650M. Visual analytics identified 20% of SQL accounts that would have otherwise not been marketed to or acted upon by sales. 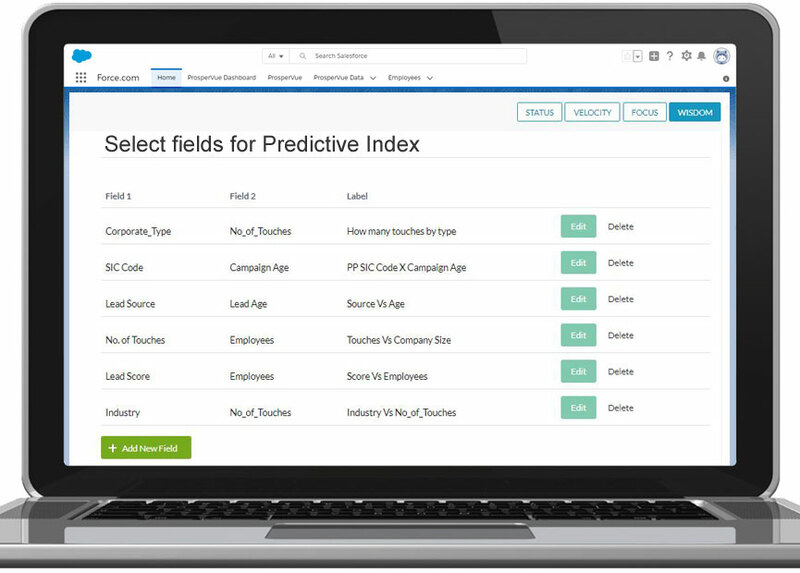 ProsperVue supports the Salesforce Lightning Experience as well as the Classic interface. Users on the Lighting Experience will notice updated styling while users staying on Salesforce Classic will encounter functionality they are familiar and comfortable with. Use the Salesforce filters you are already familiar with to cut through information overload. Find the info you need now, so you can get back to sales calls visits and campaigns as quickly and seamlessly as possible. These filters ensure that only data that is relevant to a user is provided. Extend your organization’s data by defining custom objects. Keep track of unique data stored in Salesforce by configuring custom objects into ProsperVue to fit your organization’s needs. With the flexibility of ProsperVue set-up, easily customize the data your sales team needs to view. ProsperVue utilizes the ArcGIS platform by ESRI, the most widely used mapping solution in the world for large enterprises to solve complex geo-analytic problems. Harness this power with your own data to help your Salesforce users be efficient and results-oriented. Add search results from the map to a marketing campaign for location-targeted marketing campaigns. Impress your accounts and prospects by sending them tailored location-based messaging and more. Generate latitude and longitude to plot address data in Salesforce for any object. Advanced geocoding has many built-in cleansing and standardization features to provide maximum global coverage with unlimited records, scheduling and batch geocoding, automatic record updates and select the address field you wish to use. Customize your boundary search. Draw a circle, square or any freehand shape. Within that shape you can run searches, add to campaigns, create and export data lists. Perform actions en masse with one click, like change lead owner. Within a radius set by your Salesforce admin, you can see all chosen objects within that radius. For example, see all accounts and leads within a 100 mile radius, or within a 20 mile radius, or any other radius size that you set. The radius size depends on your business and your needs – are you a single-location local business? Or do you sell nationally and you are seeking nearby accounts not too far from leads, to use as references? Search any location, landmark, etc. anywhere in the world. Suggestions pop up as you type, making it easier to find that location. Then go to that location instantly and view the records for any object in that area. Run LinkedIn and Google searches with one click right in the app. Learn about the contact or company, visit their website, see what connections you share and more. Color-code the pins for any picklist or text field at any time. Users can see each value of that field in its unique color for easy visual identification. Let reps quickly see who to visit next, who needs to be called more frequently, or who is a higher value prospect or who is more likely to buy now. Only display data where the customer or prospect has given permission. 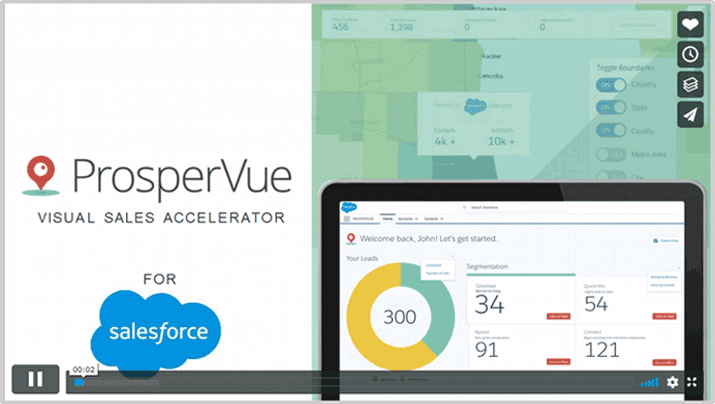 The ProsperVue Analytics Edition puts the power of advanced analytics to work inside your Salesforce org. Insights from predictive scoring accelerates the sales process, increasing customer lifetime value. The Analytics Edition includes all geolocation and visualization features in Mapping Edition. Visually stunning dashboards provide all the necessary information in a timely, consistent and easy to view manner to all sales users. Centrally develop and configure the dashboard components by sales, marketing or analytic experts, and distribute based on user profile to provide a customized and highly relevant view to sales users. Create unlimited simple and advanced segmentation, as well as propensity models and save them to an internal library managed by the admin. Release only the ones you want to sales users, or archive temporarily, or make changes and update the segments. Let your data scientist create and store segmentation, models and more. All within Salesforce! Transform the data to get more value and draw insights. Maintain these internally, ready to deploy. Create propensity models to target best industries, lead sources, geographies and more. A sales analyst can evaluate, build and save several models in a library. Then apply only the models you want to the dashboard to serve the sales users, producing scalable, analytics-driven results. Easily apply the algorithms to score records in any object. Find the best customer profile for accounts, and tag all records with the score for the same profile in leads, contacts or opportunities. Apply scores to prioritize calls and visits, simulate close rates, update forecasts. Take full control of business development and customer life cycle. Top 20% of customers typically generate 80% of revenue. Easily let reps prioritize accounts in top industries, and identify high value prospects in others. 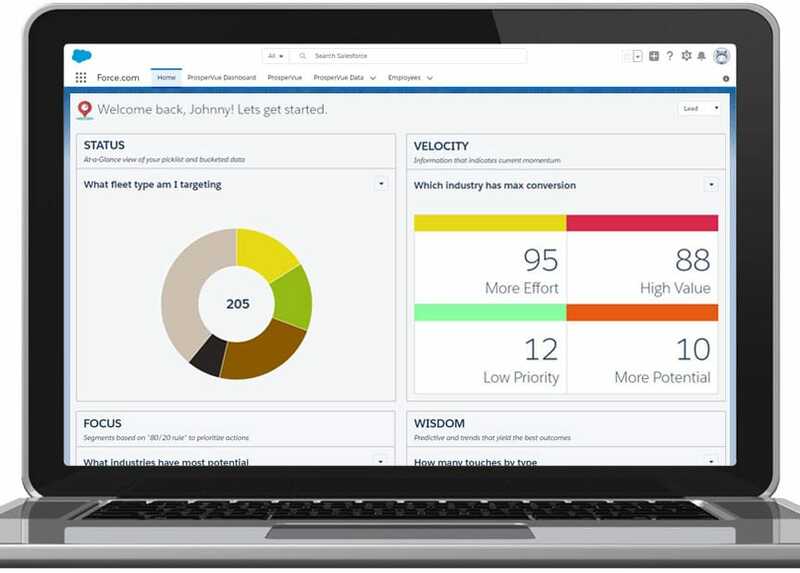 Identify powerful insights of customer, market and industry trends to let reps take action. The analytic team can work with sales leaders to deploy the right models to the right users (profiles or roles) for seamless execution in one click.